Kermit Davis and the No. 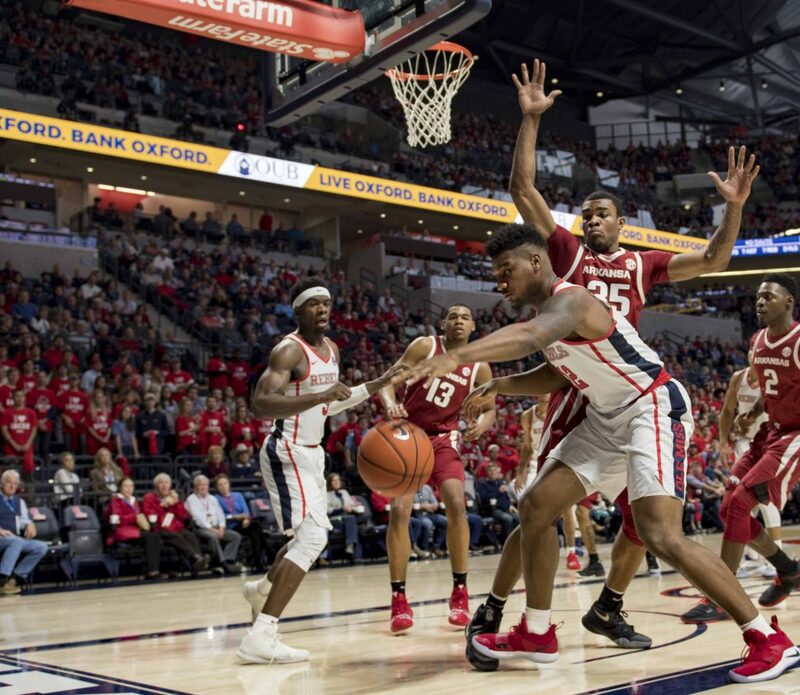 18 Ole Miss Rebels got back to their winning ways on Saturday by knocking off Arkansas 84-67 in front of a raucous crowd in the sold-out Pavilion. The Rebels improve to 13-3 on the season while boasting a 4-1 record in the SEC. After having their 10-game winning streak snapped at the hands of LSU earlier in the week, Ole Miss relied on their maturity and experience and found their feet early versus the Razorbacks by scoring the first seven points of the contest while never trailing in the 40 minutes of action. “We have had two top-15 wins, but that was probably the best win of the year,” Kermit Davis said, who was proud of the way his team bounced back after the Rebels were handed their first loss in SEC play against LSU on Tuesday. Four Rebels finished in double-figures headlined by Breein Tyree who led the way with 22 points on 7-of-15 shooting. Terence Davis picked up right where he left off as the reigning SEC Player of the Week by dropping 18 points and collecting nine rebounds, just one board short of what would have been his third double-double of the season. Dominik Olejniczak drew the assignment of matching up with preseason 1st team All-SEC forward, as well as a projected first-round NBA Draft selection, Daniel Gafford. Gafford entered the matchup averaging 17 points and just over nine rebounds per game. Olejniczak stood his ground scoring 13 points, all of which came in an explosive first half for the 7-footer out of Poland. Bruce Stevens, who spelled Olejniczak while he was out, contributed with 14 points of his own to go along with seven rebounds. Both Olejniczak and Stevens outscored Gafford, who finished with nine points and 10 rebounds. “I thought tonight, that’s the best they have played,” Kermit Davis said, who was pleased from the production that came from the center position. With Devontae Shuler, the team-leader in minutes per game with 32.8, coming off the bench for the first time all season, it was senior D.C Davis who started at point guard for the first time in his career for Ole Miss. The former walk-on didn’t shy away from the moment scoring seven points while setting career-highs with 27 minutes and four assists while Shuler, who is dealing with a stress reaction in his foot, had 3 points in 25 minutes. “This whole season he’s been playing well for us so, it’s a credit to him and his hard work and character,” Tyree said, who was impressed with how Davis played in his first start of the season. The Rebels are back in action Tuesday night at 8 p.m. as they march to Tuscaloosa to do battle with an 11-6 Alabama team that ranks in the middle of the pack in the SEC at 2-3. The Rebels will look to continue climbing the ladder in the SEC after being picked to finish last in the SEC preseason poll.